Discussion in 'Hyundai' started by PaleMelanesian, Aug 1, 2014. I had a Veloster rental for a 500 mile round trip business drive. Two coworkers along, I did the driving. It had the 6-speed dual-clutch auto with paddle shifters. This will be a quick overview, but thought someone might find it useful. Overall the car is "snug" or "cozy". You sit down in it, and the beltline is way up at shoulder level. The roof is low, so the windows are little slits. Headroom in the back is bad. The rear sunroof/hatchback glass distorts the rear view badly. You can see well enough, but it's like a fun house mirror. The three-door layout is weird and mostly awkward. The driver's door is long you can't fully open it in tight spaces. The two doors on the other side are small so they're hard to get in and out of too. The back seat only has two spots, with cupholders in the middle. Good luck climbing across to the far side rear seat. Seats are supportive, heavily bolstered. A bit narrow, even for me at 160 lb. The headrest is too far forward, like all new cars. The seat bottom cushion is nice and long, but that's not much use to me with my long legs hovering above it. It has a telescoping wheel. That's a lifesaver for me at 6'2". The wheel is standard high density spongy foam stuff, perfectly fine. The gas pedal is bottom hinged. Felt weird. The transmission - dual clutch auto with paddle shift - is good. It holds gears pretty well when you request it. Shifts are firm but not jolting, meaning it's not wasting time or energy in between. RPM is 2200 at 60 - a bit high, considering it has six gears. It will downshift on hills, but a quick pull on the right paddle and it drops back down where you want it. It is not a fast car. You'll have to get the Turbo for that. Mostly cruising with some downhill neutral coasting, the car did 36 mpg on the round trip. Then this morning on my normal commute it did 48 mpg. Being a Hyundai auto I didn't FAS it, but the manual says it's ok for towing "under 10 mph for less than a mile". 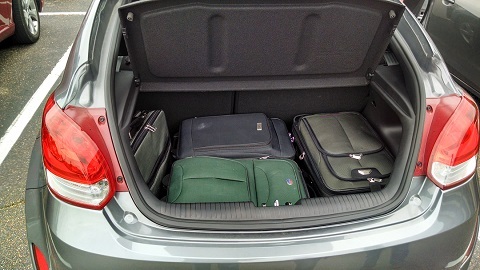 Cargo space isn't great. 15.5 cubic feet officially, but the shape is awkward. The bumper is high and the load floor is low, so you have to lift cargo up and over and lower it down. The sun visors have an extension so they actually work on the side! Highway ride and handling are good, but the rear suspension gets unsettled on bumpy surfaces. Steering feel is good. Based on my experience, it's clearly not the car for me. Cargo is tight and awkward and it only seats 4. I would, however, consider an Elantra GT based on this drive. It solves most of the compromises made for the Veloster. I imagine your co-workers wanted to cruise at 75 MPH with A/C. Gearing not TOO bad , considering it's only 1.6 liters , but with six gears , you'd hope for lower cruising RPM. I could tell the first time I saw this car "it's beautiful , can you see OUT of it ?" Yeah gearing is about what I would have expected. Hmm, same goes for the rest of the car. I'm more surprised that Velosters are showing up in rental fleets. You'll never see a CR-Z in a rental fleet.